Have I got a deal for you. 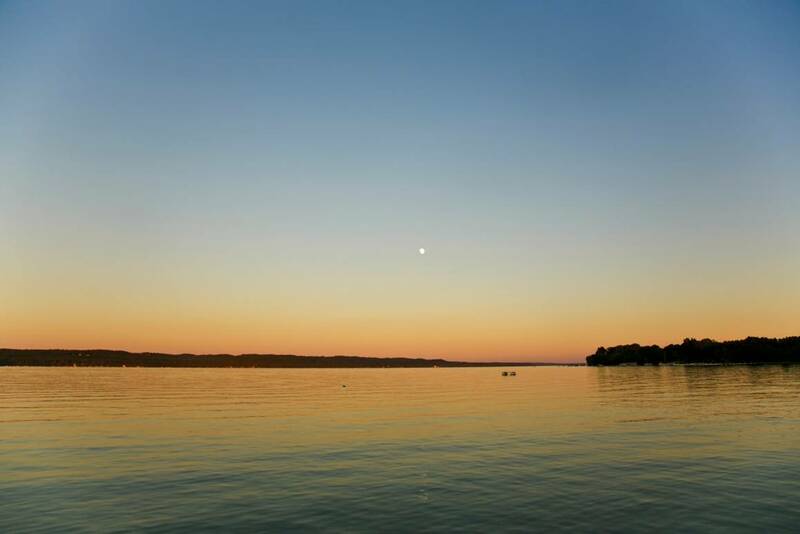 Babs Young took this picture at 9:15 this evening, looking south from the northwest end of Torch Lake. She says it’s further proof, should you need any, that the west side is the best side. You could come up and decide the matter for yourself. Beginning today, Antrim County Democrats are auctioning off a whole raft of great stuff donated by members. Vacations. Boat rides. Art. Tickets to some of the great movies coming up at the Traverse City Film Festival. (If you win that bid you get to go to the movie with Michael Moore. There is hardly anybody who’s more fun at a movie than Michael.) Proceeds will be used to campaign vigorously for the Democratic ticket. If you would like to help us do that–or if you don’t care one way or the other but would like to bid on a really great vacation package or a dinner for six or a photography lesson from You Know Who–toddle on over to the Antrim Dems website and examine the goods. Or just download the auction catalog and dream a little. Bidding for the online part ends on July 14. There’s a party on July 17 from 7-9 at the Blue Pelican Banquet Room on East Torch Lake Drive. We’ll finish up the bidding on the most special items at the live auction that night. There will be some surprises in a silent auction, too. Also excellent treats. I don’t see how you can go wrong, but just to add one more enticement, if you go over there to bid because you read about it here, and if you win the bidding on one of the vacations, Miss Sadie, the Cowboy and I will treat you to breakfast for two at Chris and Sonny’s Torch Lake Market. How can you resist? You can’t. Have fun. What a great plan. Best of luck on all of that, hope you make bundles of $! We’ll see. It’s kind of complicated, but we’ll keep at it. P.S. Thank you! Thank you. I’m sure we’ll raise some funds for the Antrim County campaign – small chance of victory for Democrats in local contests, as this is a pretty solidly Republican area. However, Michigan itself is much more Democratic, and we will add our mite to the whole. It’s almost irresistible but the bus trip would be just a bit too far. I hope you sell everything and that your campaign goes well. Bus trip a bit damp, too. But my oh my how you and Mrs. T. would enjoy cycling around Torch Lake. Thank you for the good wishes. We would. Mrs T likes flat routes in particular. Oh for sure you can’t go wrong! 🙂 Will stop by the sites after work when I can take the time to make considered bids. It turns out to be a fairly complicated process. But we are intrepid. We persevere. That’s a beautiful photograph (with the almost-full moon over the lake), and I’m not surprised that there is plenty going on over on your side of Grand Traverse Bay, too. If I didn’t live Up North (and work every day of the summer! ), I’d want to come up on vacation, for sure. Heck, that’s what I used to do! I know, me too, me too. If I win the pie auction I will trundle ’round the Bay to Northport and share it with you. Good luck with the fund raiser. This is why I have moderated comments, rascal. The fund raiser will come in handy, though I do not expect it to play a major role in the Obama campaign treasury. 🙂 We will put it to good use running our local campaign in support of the entire ticket–and precinct by precinct that adds up.